Charlestown, formerly an independent city occupying what is now Malden and Medford, is currently one of the larger residential neighborhoods of Boston. Many of the city’s residents live here and commute across the Charles every day. 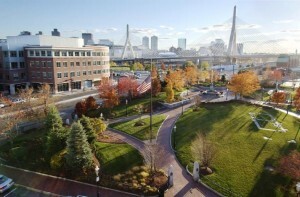 Originally settled as a Puritan city, Charlestown once included much of the land north of Boston. During the Revolutionary War, Charlestown became famous for the Battle of Bunker Hill, the first major battle between British and Patriot forces. Over the course of the next century, areas of Charlestown broke off and became separate towns and cities. In 1873, Charlestown finally incorporated as part of Boston. Many of the residences here are two or three story row house apartments. Housing in the outlying areas typically consists of Capes or Classic Cottage style houses, single level houses with a wide front and relatively narrow sides. Closer to the water, much of the space is open air, with warehouses and other low-rise structures built to support the port.